Royal Revolt! deals with a medieval family feud that lets you play as a warrior, where you need to defend your castle, and prevent your enemies from invading your entire colony. While some aspects of the game are no different with the likes of Trenches and Swords, Royal Revolt! takes it a step higher, giving users 3D perspective experience like no other. Let’s unravel more secrets about this medieval-based game for Windows 8. 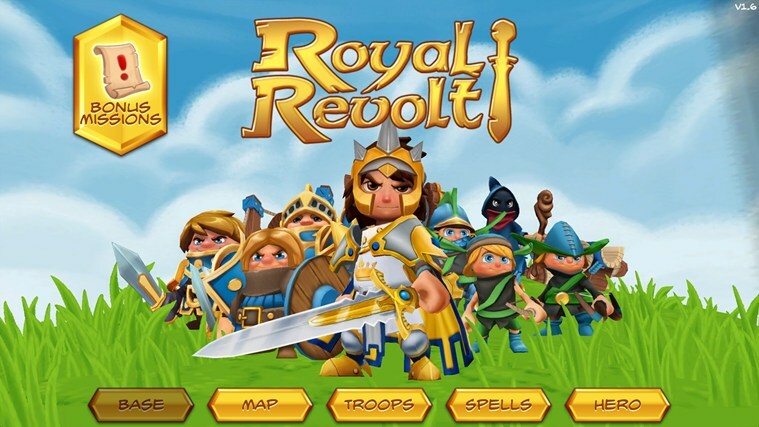 Play and enjoy every battle using this Windows 8 Royal Revolt! It serves as the launching platform of the entire game. From this, you can already start a level, manage your spells, and buy special gems to upgrade your stamina from the in-app purchase (IAP) center. This aspect of the game is similar to the map view of The Crystal Maze, which according to O2’s review, allows you to wander through four original zones, in a quest to defend your army to amass crystals. You will play as the Prince, the ultimate hero with special abilities including healing and attacking spells. The impact of your attack will depend on the strength of the spells you will use. Take note that you need to strike the right balance between attacking and providing back-up, as the success of the game lies on your lifespan. Before you start, you need to load a large troop. Every level, you need to assemble your troop for defense, as your enemies are waiting in line to target and destroy your castle. Adding to the game’s entertainment value are the 3D animations and graphics, working seamlessly on any Windows device. From the screen, you will notice that your character’s health is on the upper left, while your army is located at the lower left. You can access the wide selection of spells in the lower right, which rests beside the troop generation meter. As you succeed on a level, your allies will also amplify. The exciting gameplay is complemented by the controls, which is a joy to use. However, just like in Infinity Blade 3, it may take you a little while to master the “click to move” control scheme. But the good thing is that you will eventually be skilled at managing all the game aspects at once. Overall, the game is interesting and challenging, with the injection of the comedic element. Other than good controls, the game focuses on a solid concept, a vital aspect that spells the longevity of an action-packed game. Is this the type of medieval game you’re looking for? Next Next post: Microsoft’s Project Siena App hits the Store!